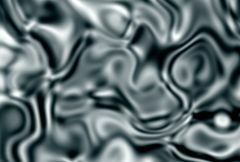 Creates an abstract texture resembling folded cloth or liquid that can be animated to give a dynamic turbulent effect. The Fold Speed parameters cause the pattern to automatically undulate over time. Fold Amp: Default: 72, Range: any. The angle of the folding distortions. Fold Freq: Default: 0.5, Range: 0.01 or greater. The frequency of the noise used for the folding distortions. Fold Octaves: Integer, Default: 1, Range: 1 to 10. The number of octaves of noise to use for the folding distortions. Fold Start: X & Y, Default: [0 0], Range: any. The offset of the folding effect. Fold Speed: X & Y, Default: [1 0], Range: any. The speed of the animated folding effect. If non-zero, the folding effect automatically undulates at this rate.